Patties of human flesh: Hannah Greenstreet can’t get the smell of cooking meat out of her nostrils after Sarah Kosar’s “visceral, disgust-provoking” two-hander. Mumburger, Old Red Lion Theatre. Photo: Lidia, Crisafulli. What do you want to happen to your body when you die? Burial? cremation? To be made into burgers and fed to your family? 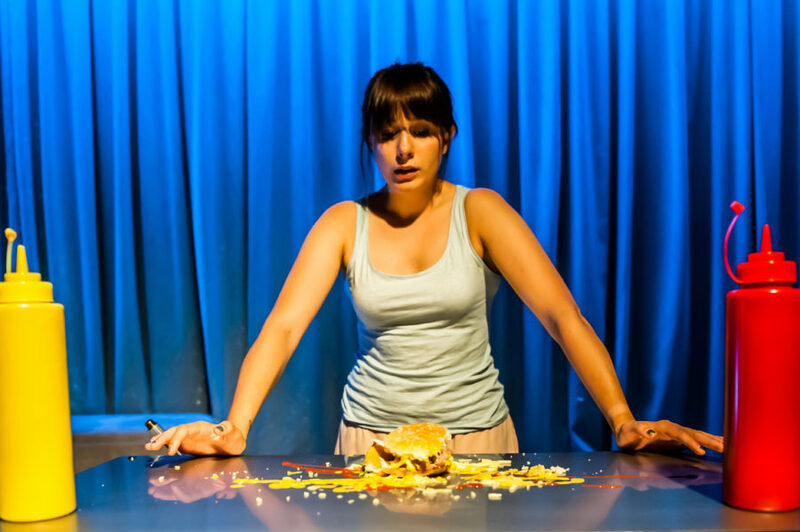 The third option forms the basis of Sarah Kosar’s darkly comic new play Mumburger. Tiffany (Rosie Wyatt) and her dad (Andrew Frame) are dealing with the aftermath of her mum Andrea’s sudden death in a car accident. Tiffany’s way of coping is to make an “actionable plan” to do all the things they need to do: choosing a casket, organising the funeral, registering the death. Her dad seems to be in denial, much to the infuriation of Tiffany, who spends quite a lot of the play screaming at him in frustration. A greasy brown paper bag falls from the lampshade like a deus ex machina. Tiffany accuses her father of ‘cheating’ on the vegan lifestyle her mum prized by ordering meat. Her Dad denies all knowledge. The note attached is a message from beyond the grave, setting out Andrea’s last wishes for a “digestive memorial”. She has had herself made into burger patties, some for now, some for the freezer. Tiffany and her Dad now have a moral conundrum: disobey Andrea’s last wishes, or eat their mother/partner. This raised a few questions for me beyond the moral, which the play did not fully explore. Firstly, would this be legal? Perhaps – according to the Guardian, cannibalism is not against the law per se, but the family could be charged with preventing a lawful burial. Secondly, is cannibalism vegan? The Vegan Society defines veganism as “a way of living which seeks to exclude, as far as is possible and practicable, all forms of exploitation of, and cruelty to, animals for food, clothing, or any other purpose”. Meanwhile, People for the Ethical Treatment of Animals say that, “If people must eat animal carcasses, roadkill is a superior option to the neatly shrink-wrapped plastic packages of meat in the supermarket”. So, as Andrea is technically roadkill, it must be okay for her vegan family to eat her, right? The logistics also troubled me. Who did Andrea get to provide this service (mincing and delivery, a mere 72 hours after her death)? How did they get her body? How did all five foot, nine inches of her fit in the small paper bag? How did she not go off when Tiffany and her dad left her out for the night, rather than putting her in the fridge? The play provoked these questions for me because it straddled a space between the surreal and the naturalistic. The absurdity of the premise of “mumburgers” served as a way into exploring themes that could otherwise be hackneyed – ownership of memory, legacy, processes of grief. Some of the most tender moments of the play, which cut to the heart of Tiffany and her dad’s relationship, were the most understated: he offers her a twenty pound note; she says she does not need the money, but takes it anyway. As her mother tries to nourish Tiffany after her death, her dad’s way of showing he cares is financial. Kosar’s keen sense of the absurd also results in some hilarious one-liners. Tiffany’s poetic, spoken-word monologues and her Dad’s re-enactment of scenes from Father of the Bride were less effective, perhaps because they seemed to be from a different play dramaturgically. I could accept that, within the world of the play, it might be thinkable and feasible to eat one’s mother. However, once I had accepted this, I wanted more of a naturalistic grounding in the when, where, why and how. Maybe I am allowing myself to get distracted by the literal, but the “mumburgers” were more than a metaphor, as Tommo Fowler’s direction emphasised. In a memorable scene, Tiffany’s Dad grills two patties on the table with a blowtorch, before Tiffany takes a bite of her mother and immediately throws up. It was the smell of cooking meat, sizzling through the Old Red Lion Theatre, that took the production from intriguing intellectual dilemma to visceral, disgust-provoking theatre. It is testament to the powers of suggestion that, although I knew the patties could not be human flesh, I was convinced they were. The smell of meat clung to my nostrils all the way home. Mumburger is at the Old Red Lion Theatre until July 22nd. For more details, click here.